In 1916, America's sweetheart (although she was born in Canada), Mary Pickford, created her own production unit, Pickford Film Corp., allowing the star to select her own roles, choose her own director, name the cast, make the final cut - and take half the profits (the other half went to the Famous Players studio, headed by Adolph Zucker). 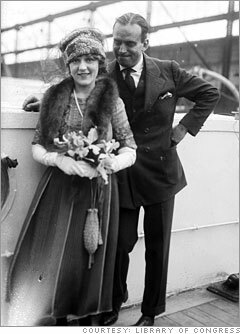 After that contract expired, Pickford became one of the co-founders of United Artists (with Charlie Chaplin, D.W. Griffith and Douglas Fairbanks) in 1919. UA helped to tip control of film production and distribution toward the artistic talent and away from the studios. Pickford and Fairbanks went on to produce and shoot their own films at their own studios. Pickford's combination of box-office clout and business acumen made her the most powerful woman in Hollywood and helped to shape the movie industry. She retired from acting in 1933 and sold her interest in UA in 1956, dying in 1979 after years as a recluse.